Every year, right about October 15th and continuing to the end of the year, I sink into a vortex of panic and guilt over the challenges I’ve committed to but did not complete. I start buckling down and reading the books in order to complete the challenges, but there’s no joy in it. So I said I wasn’t going to do it/any next year. 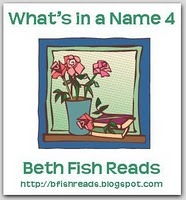 And then Beth Fish Reads announced the What’s in a Name Challenge #4 and I clicked on the link and I couldn’t resist! I have moderately a sized TBR stack and a listening queue that only seems to grow and I’d really like to make a dent in either/both. To that end, I decided to participate in the What’s in a Name Challenge #4 using titles that I already had on hand. Looking at the newly arranged stacks though, I realized I still needed a creative and interesting approach to the challenge. With some Thanksgiving Weekend introspection aided by an inexpensive bottle of Viognier*, I decided to create audio-print-video entries wherever possible. For instance, for the Numbers category I could read 1421 (by Gavin Menzies) watch 1421 (the PBS documentary based in the book) and then go on to listen to 1434 (by Gavin Menzies; narrated by Simon Vance.) Some of the categories won’t be that neat; but the fun is in the trying! Besides being fun, and helping to clear my bookshelves and queues, the challenge also enables me to expand my blog beyond just posting audiobook reviews. Sometimes it’s days or even weeks before I can post audiobook reviews and the challenge will allow me to ramp up my blog without getting meme-y or abandoning the audiobook core of the blog. * Oh, by the way, drunk blogging. Don’t try this at home, kids! The dangers of writing a rambling, heartfelt, badly misspelled and grammatically atrocious post about blogging, identity, audiobooks, the Mighty Mighty Bosstones and babies is apparently very high! When I was in high school and VHS tape players had become household items, I rented George Romero’s ‘Dawn of the Dead.’ I thought it was lame. I laughed and went to bed. And then proceeded to torture myself with imagining myself in a shopping mall, hopelessly surrounded by zombies. If you read my post about The Amityville Horror, you may realize that horror, bedtime and an overactive imagination are the prime ingredients for that peculiar psychological stew that I get myself into and that I’m sure mental health professionals would love to savor at hourly rates… So it should come as no surprise that I’ve never really bought into the zombie culture. I don’t recoil at the thought of zombies like I do Satan, but you have to give me more than the fact that there are zombies involved for me to be interested. In the case of The Reapers are the Angels, the deciding factor was this review written by Julie D. over at SFF Audio, appropriately titled, “Review of The Reapers are the Angels by Alden Bell.” Now, even though I have not read or listened to any Flannery O’Connor (hangs head in shame) and Julie D. clearly states “It isn’t Flannery O’Connor…” the review managed to hit upon my literary pretentiousness and intrigue me. So off to the warehouse I went and snagged an MP3-CD. Those are the opening lines to the some of the most mesmerizing, beautifully wrought and gorgeous writing I’ve ever experienced. The basic linear narrative is that a fifteen-year-old girl from Tennessee treks through points South to deliver a charge (a retarded man) to his home in Texas. The world had changed in the past twenty-five years so that the landscape is populated by zombies; but far from this being some sort of cheap gimmick, the zombies serve as the counterpoints to the passages about civilization, humanity and, lots of “deep thoughts.” Shades of ‘I am Legend’ (by Richard Matheson, starring Will Smith) come to mind; but then again it’s much more than that, with its Carson McCullers-plus-George Romero writing style and the sense I’m listening to lit-fic rather than pulp. Yes, some of the scenes are gory, but there is a both a macabre and entrancing quality to those scenes that keeps the listener riveted. There are scenes imprinted in my mind’s eye like a dream with the same sense of surreality. As for Tai Sammons, she was dead-on right as the voice of Temple, the protag in this story. The audio sounded like Temple telling her story, with Temple casting the roles of the other characters, not Tai. And Tai also kept true to the voice of Temple throughout the story, even when it could have easily shifted into another narrative voice. If this wasn’t the end-of-the-year crunch for me when I was trying to finish up all my challenges, I would do something I have never done before: re-listen to it immediately. I suspect that the ending isn’t what many people would like or expect; but it really couldn’t be any other way and still be “true.” Loved this audiobook. 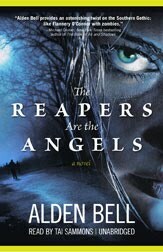 OTHER: I borrowed a library CD copy of The Reapers are the Angels (by Alden Bell; narrated by Tai Sammons) from Blackstone Audio. I receive no monies, goods or services in exchange for reviewing the product and/or mentioning any of the persons or companies that are or may be implied in this post. The Yahoo! Group Sounds Like a Mystery (S.L.A.M.) is sponsoring another little mini-challenge, the S.L.A.M. 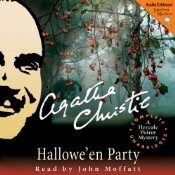 Holiday Challenge, wherein participants pick four audiobooks, preferably mysteries that have a holiday theme. The first book I chose for this challenge was Hallowe’en Party and I scored a copy from the Jackson County Library System which serves Southern Oregon. 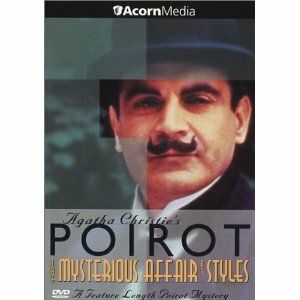 In this later Poirot mystery (1969,) Poirot himself is an older gentleman who must negotiate the changing mores of the times and, their influence on the crime as much as he must be able to discern the facts of the case. The case involves the drowning of a 13-year-old girl at a Hallowe’en Party and overall, the plot is a bit thin and incredible; but does underscore the social commentary that Agatha Christie, clearly an older woman herself dismayed at the changing world, has embedded in this tale. Though a listener may argue that the story remains relevant to present times, it does get a bit tiresome after a while. The narrator, John Moffat starts off reading rather quickly and I was, at first, afraid I was going to have trouble keeping up; but he either settles down or I got used to him because I ended up not having any trouble at all. His character delineations were excellent, to the point that, though it sounds cliche, there were times I wondered if I was listening to a single narrator! 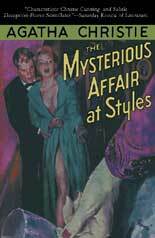 It was all rather interesting to compare this work with the first Hercule Poirot story, THE AFFAIR AT STYLES. HALLOWE’EN PARTY was simpler, heavier on the social commentary and slower in pace. “Styles” was more dynamic in style, pace, characters and setting; but there is something to be said about an author who exercises her right to truly develop her characters over the arc of a series and enable them to respond to the changing times. When I was eleven years old, I was a very devout little Roman Catholic girl. I went to Parochial School. I wore plaid skirt uniforms. I had nuns in habits for teachers who also wielded yardsticks. I paid attention in Church and when I grew up, I thought it was prerequisite to be a nun before you could be a teacher or nurse. I was a believer. The year was 1976 and my best friend’s name was A. That’s not really her name or even her initial, but even now I’m afraid that somewhere, someone will know exactly who was complicit in this tale and I might get in trouble, like maybe go to hell or have my Confirmation voided or my eighth grade diploma declared invalid. Anyway, A. got her hands on a copy of The Amityville Horror. It was quite the sensation at the time and everyone believed it was true. How A. managed to get a copy of this book is not important; but it was lent to her with the caveat that she tell no one that it had been lent to her, who had lent it to her, and that she probably shouldn’t tell anyone that she had the book at all. But I was her BFF and so of course I knew and of course, I was insanely jealous that she had been entrusted with this book when I had not. I persuaded her to lend the book to me for one night and she reluctantly agreed. And so begins the most terrifying period of my life. It started that night and ended four years later. During that four year period, I believed I was doing nightly battle with the Devil for my soul. I prayed fervently. I cried myself to sleep. I wouldn’t sleep with my back to the door because for some reason, I thought Satan himself would bother with the courtesy of using a human portal to come after me. And every night, I woke up at 3:15 a.m. When I developed an allergy-induced eczema on my hands, I was ecstatic, thinking I was showing the ultimate sign of devotion, the stigmata. I was going to be a Saint! Of course, when a variation of that same eczema manifested itself on my scalp, I thought I was developing the horns of a devil and that I was damned. I think it would be an understatement to say that upon finishing that book that night, I was immediately scared and scarred for life. Flash forward to 2009. One of The Sisters (Acquisitions Agents for Blackstone Audio) tells me she’s bought the rights to this book. I hadn’t thought about the book specifically for years, though I still hate seeing flies in cold weather and still prefer not to sleep with my back to the door. I tell her the story of my eleven year-old self which was probably a mistake as she starts sending me “funny” e-mails, signed “Jodie.” Sigh. A little later, I was in Studio A working with Ray Porter on another project and he mentions that’s his next narrating job is The Amityville Horror. He talks animatedly about the book and we share a few laughs and he goes on his way. I can’t wait to hear the audio. Though I had hoped it would be released by Halloween of 2009, it was released in March of 2010 (?!) And so now we come to 2010. It’s Halloween and I want to listen to this book because I want to see if it stills has any hold on me and because I remember Ray Porter being so enthusiastic about it. When Jason was looking for recommendations for an October Selection for The Audiobook Club Online, I didn’t hesitate. I offered copies for a promotional give-away and we were off. I uploaded the audio onto my iPod and, I have to tell you, when I heard the Priest’s Introduction, there was a moment when I had to take a little breath. I wondered where my rosary beads were and if I found, them, would I remember how to say it? But after the Introduction, I have to admit I was a little disappointed in the audio for two reasons: 1) Ray Porter sounded stiff and 2) the story didn’t seem scary or real. I really don’t know what to say on Ray Porter’s behalf, other than that, if you had heard him talk about the book in Studio A that day, you wouldn’t recognize the narrator of the audio. Gone was the enthusiasm and half-convincing incredulity. I mean, as much as we scoff at tales of the paranormal, I think I can honestly say there’s a part of us that illogically believes. I wanted to hear that little voice that decried the debunking of the story. Ah, the story itself. The writing seemed a bit amateurish and the story unbelievable. Could anyone really have believed that story? Looking at the story now, it seems pretty clear that George and Kathy Lutz took on more than they could financially handle when they purchased that house and, they found a way to exploit The Exorcist fad and walk away from their mortgage. I say that and sound so cynical. But I know that given the chance to live at 112 Ocean Drive, I wouldn’t. All it would take would be for me to wake up one night at 3:15 a.m. and that “little voice” I spoke of earlier? That would be the screams of an eleven year-old who still believes. 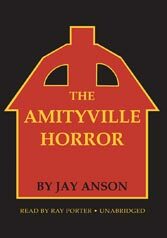 OTHER: I borrowed a library CD copy of The Amityville Horror (by Jay Anson; narrated by Ray Porter) from Blackstone Audio. I receive no monies, goods or services in exchange for reviewing the product and/or mentioning any of the persons or companies that are or may be implied in this post.